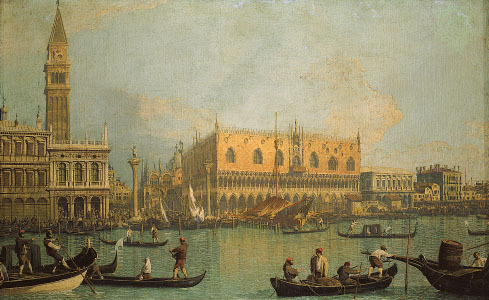 I just completed arrangements to visit Venice for a couple of days later in August, on the back end of my week at Oxford. The program had an optional extension to Paris, which I bagged because it seemed overpriced, so my return flight was scheduled four days after we finish up the program in Merton College. So now I'll have a night in Zurich (my first time in Switzerland, strangely enough), two in Venice, and another night in London. Reuters ran a story today projecting Barack Obama winning between 52 and 55 percent of the popular vote on November 4, based on complex models used by economists successfully in the past. (One of the best-known such economists is former Choate parent Ray Fair.) Such a margin means it's likely Obama will win the Electoral College as well, though the Fair model projected a Gore popular vote win in 2000 which, though accurate, did not result in Gore moving into 1600 Pennsylvania Avenue! - If Nadal wins the title, he will become No. 1 this Monday. This makes an already enticing semifinal matchup against Novak Djokovic tomorrow all the more interesting. The Mummy: The Tomb Of The Dragon Emperor was not a film I was dying to see. I drove the scooter over to Cheshire this morning to see a couple Choate Tennis players competing in a men's tournament, had a bite to eat with them afterward, and then raced an oncoming storm back to Wallingford (I got only a little wet and made it home before the downpour began). But when I settled in to watch the semifinal between Andy Murray and Ivo Karlovic on Tennis Channel the power suddenly cut out about a half hour into the match. So facing the alternative of sitting at home in the dark, I decided to head to the cinema instead. This second sequel to The Mummy is perfectly absurd, mindless summer entertainment. If you go in with low expectations, you'll be all set. 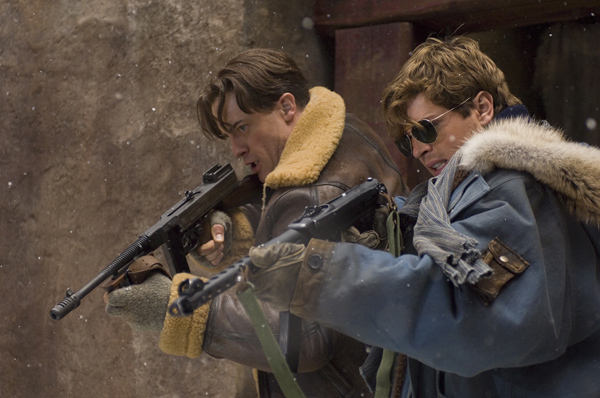 Think of the movie as a roller coaster rude: fun but entirely forgettable. 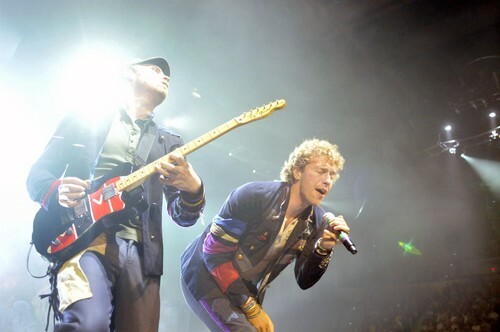 I was surprised not to hear "Speed Of Sound," which had appeared on the set list earlier in the tour, but hard to complain about the band's choices this night. As if to remind us all that he still intends to be included in the equation with all the recent focus on Nadal and Federer, Novak Djokovic made a statement in upending a fairly worn-out Rafa Nadal in Cincinnati tonight. This will delay Nadal's ascension to the top ranking a couple of weeks. It also re-establishes Djokovic as a threat in the upcoming U.S. Open. He is clearly at his best on hard court, winning in Melbourne and Indian Wells this year and advancing to the finals at Flushing Meadow last September. 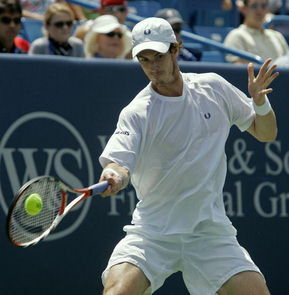 And should he prevail at the Open next month, he would own two of the 2008 majors, as would Nadal. Would that drop Federer to #3? It certainly would make the Olympics gold medal and the Masters Cup title more important in sorting out these three contenders. 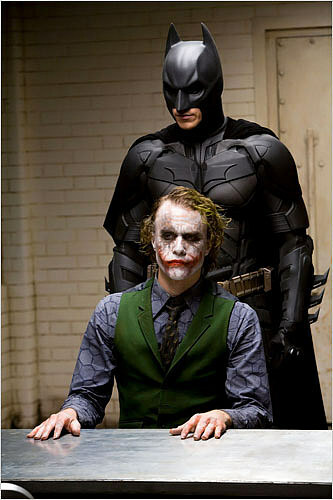 I saw The Dark Knight for the second time, catching a late showing on an IMAX screen in Manchester, Connecticut. The film holds up quite well upon repeat viewing; in fact, there were plenty of details and thematic nuances I picked up this time around. I was once again struck how the acting throughout was first rate: yes, from Heath Ledger, as widely noted, but also from Christian Bale, Gary Oldman, Aaron Eckhardt, Maggie Gyllenhaal, and Michael Caine. The action sequences were well staged, with the exception of the final showdown with the Joker in which the sonar view in the quick cuts made things a bit confusing. Hard not to marvel at the high intensity scenes with the vehicles on the streets of Chicago--oh, right, make that Gotham City. 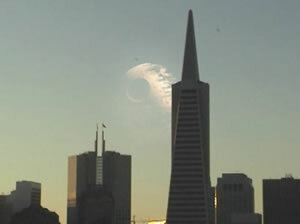 And apparently this flick continues to set all kinds of box office records. Well-deserved success, I'd say. Perhaps it was just the theater I was in, but all the hype surrounding seeing this film in IMAX seems a bit over the top. Basically whenever Batman jumped off a building or during the Batmobile's assault on The Joker's truck there was just a little bit more of the picture filling the screen. You had to really look to appreciate the difference in the frame. Maybe that's because the screen size was not significantly bigger than what I expect to see in a movie theater. Seeing The Dark Knight on one of those six-story IMAX screens would be much more impressive, I suppose, if the picture expanded so the viewer really had a sense of flying through the towers of the Hong Kong or Chicago skyline. 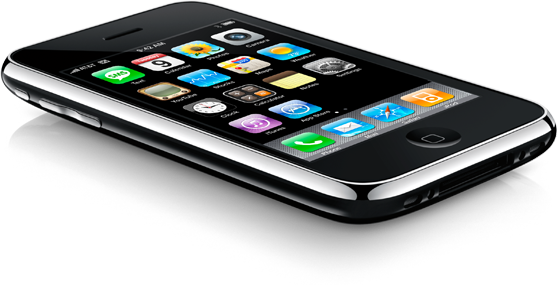 With the upgrade to the new 2.0 iPhone operating software, the device seems to be eating power at a much faster rate. And that's with WiFi and Bluetooth turned off most of the time. So I find that if I don't plug the iPhone into its USB connector to the iMac in my study before going to bed, the thing will be nearly totally drained in the morning. That never used to be the case. 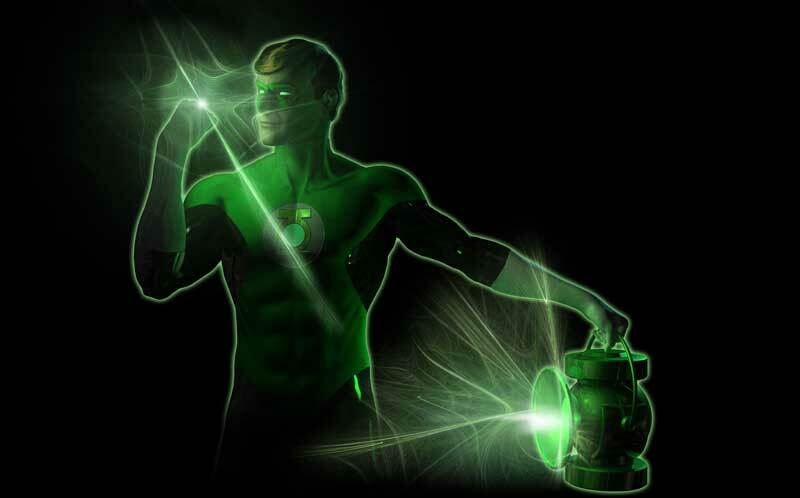 So like Hal Jordan and his power ring, I need to get into the habit of recharging at least once every 24 hours. That way, he'll be an effective Green Lantern, and I'll have an iPhone that's ready to go in the morning. 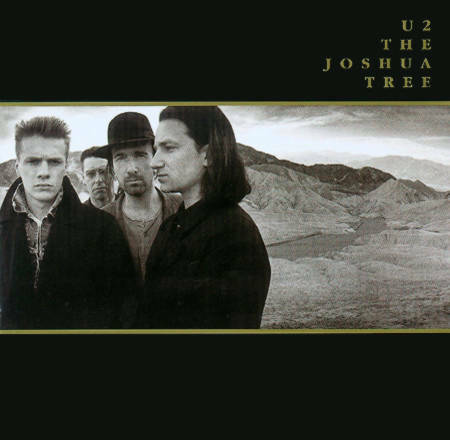 U2's landmark 1987 release has been in heavy rotation in my office CD player. I am still struck how very good this album is, with a terrific line-up of songs. 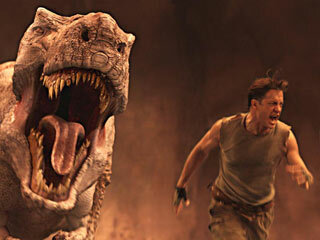 This afternoon I caught another mindless Brendan Fraser summer action movie: Journey To The Center Of The Earth. This flick was actually better than I expected, and I saw it in its 3-D incarnation, which made it a bit more fun. Don't get me wrong, this is not a film we can expect to be honored on Oscar night, but if you are willing to check your brain at the door before heading into the theater, you might find it enjoyable. I traipsed over to the Mohegan Sun Casino tonight for a Styx/Boston double bill. When I was about 13 years old, I was very familiar with Styx's body of work. Back then of course, one bought actual vinyl record albums, and Styx consistently had the kind of cover art that appealed to junior high school boys. Of course, so did Boston, with its images of American cities being transported through space on starships that looked like giant guitars. The Styx line-up was dominated by Tommy Shaw. It's clearly his band since lead singer and songwriter Dennis DeYoung was forced out about a decade ago. Thus we didn't hear some of the softer hits such as "Lady" and "Babe," as the band preferred to draw from the harder rocking classics from its past. No new music tonight, thankfully, just a parade of pretty familiar numbers, highlighted by "Come Sail Away," near the end of the set. The ensemble performed with a high level of energy and engagement with the crowd. Boston had a different vibe when it came time to take the stage. Under the leadership of Tom Scholz, as geeky a rock star as you'll find, the band was technically precise if somewhat lacking in charisma. Since Boston was always about the sound of Scholz's guitars and the late Brad Delp's vocals, the fact that these were replicated pretty well in the arena tonight made the set list a thoroughly nostalgic affair. Hearing "Don't Look Back" performed live after listening to it countless times in the cafeteria jukebox in ninth grade certainly brought back memories for me. I arrived at the Boston airport about an hour before my scheduled flight to London. Delays on the Mass Pike slowed me down on the trip up, but soon I'll be winging my way across the Atlantic Ocean. After a fairly pleasant flight, in which I got less sleep than I had hoped for mostly because Iron Man was available among the on-board video offerings, I negotiated my way through the loathsome Heathrow Airport and took the Tube to my hotel on the Strand. Much to my delight, I was able to check in early, and will be able to catch a few hours shut-eye before heading out for the day. 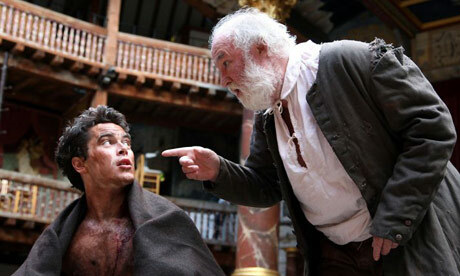 I attended a performance of King Lear in the reconstructed Globe Theatre on the south bank of the Thames this afternoon. It was a generally strong production, and David Calder was excellent in the title role. 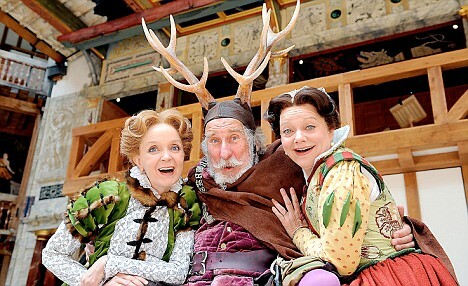 Back to Shakespeare's Globe again this evening to see The Merry Wives Of Windsor, my first exposure to this particular play featuring a comic Sir John Falstaff. I confess to nodding off a bit here and there through the performance, mostly due to the lack of sleep I've suffered in the last day or so. But this was an entertaining show, one that gives credence to the theory that Shakespeare invented the situation comedy. I'm about to head to Paddington Station in order to catch a train to Oxford. Once I arrive, I have a rental car waiting for the short drive up to Stratford-upon-Avon. I have a ticket to tonight's performance of The Taming Of The Shrew at the RSC. I may try to see if I can get into a sold out the matinee performance of Hamlet featuring David Tennant and Patrick Stewart this afternoon, too, though that looks like an unlikely scenario. And I'm not sure if I can sit through four long Shakespeare plays in a span of 48 hours. I saw the Royal Shakespeare Company's production of The Taming Of The Shrew in Stratford tonight. The RSC is in a bit of a transition right now, as its primary theater complex is being overhauled and plays are being staged in a temporary construct called the Courtyard Theatre, which mirrors the layout of the main stage. The play itself is uncomfortable to watch, as it clearly ends on a misogynistic note, at least by contemporary standards. The acting and production values were fine, but the play itself seemed lacking in characters one could root for. 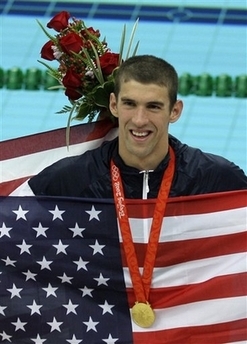 Michael Phelps blew away the field in the 400 IM final for his first gold medal of the Beijing Games. It looks as if he is swimming unbelievably well. 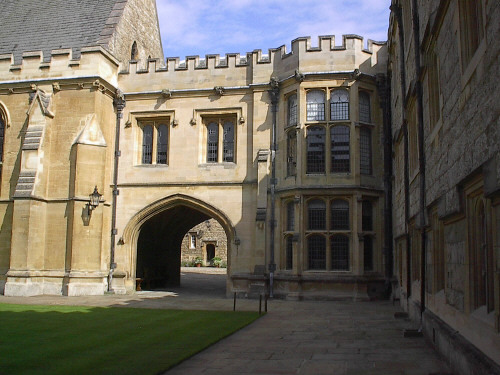 I am settled in at Merton College and ready to begin life as an Oxford student, at least for the week. For this week, at least, I am living in an Old World setting: Merton College was the first to establish its buildings in this medieval university town, and as one passes through its gates, Merton presents itself in a rarefied air of ancient buildings and meticulously maintained gardens and quads. We take our meals in a grand baronial hall, adorned with stained-glass windows, a vaulted ceiling, and the portraits of various Merton wardens (as the heads of the College have been known for over 600 years) through the ages. The college chapel is filled with history, as it's as old as Merton College itself. Ducking through arches and ambling along manicured lawns recalls the monastic roots of such a layout. And it reminds one of English period dramas, as if you are living on the set of Brideshead Revisited. My pre-bedtime ritual here in Oxford involves a bit of reading and then an episode from the first season Mad Men DVDs. This is a skillfully written and produced show, with lots of engaging elements. I should all caught up and ready to watch Season 2 episodes--which I am recording--when I get back home. As a former competitive swimmer, I was thrilled to watch the U.S. men come from behind in the final lap to edge France in the 400-meter freestyle relay today. Even though I knew the result before seeing the evening replay on Eurosport, it was palpably exciting to see the race unfold. 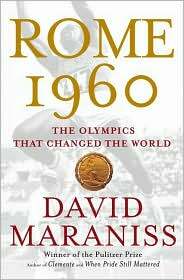 I am reading an excellent account of the 1960 Olympics in Rome by Washington Post veteran David Maraniss. This excellent overview of this particular Games touches on the politics, the emerging commercialism, the human interest stories, and the sheer drama of sport that the Olympic Games typically encompass, and does so in an engaging narrtive style. It's a treat to read this while keeping up with current developments in Beijing. I caught an outdoor performance of Much Ado About Nothing tonight--my thirteenth (!) Sheakespeare production in the past four months--and despite the rain that delayed the start and annoyed in the first act, it was an altogether enjoyable show. It was staged in a courtyard at the Oxford Castle, and itsmedieval walls formed an effective backdrop for the action of the comedy. This was a fun night out. 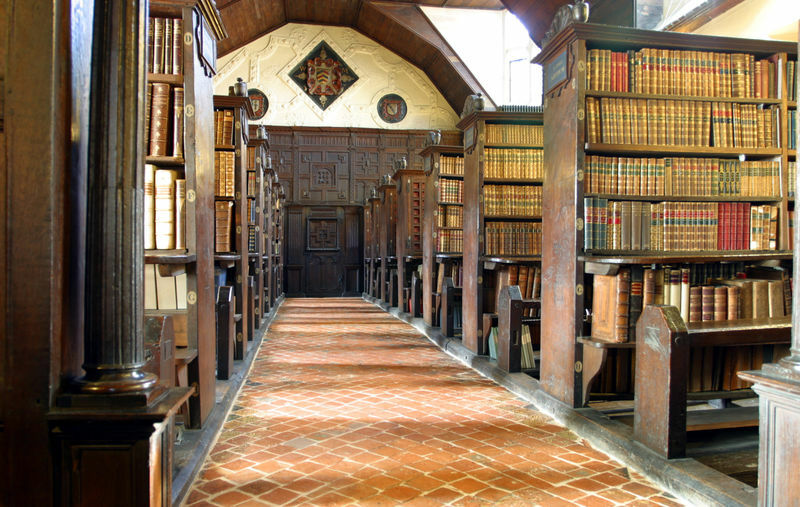 This morning I got to poke around the original library here at Merton, a facility dating from the 1370s, with manuscripts from as far back as the 9th century. 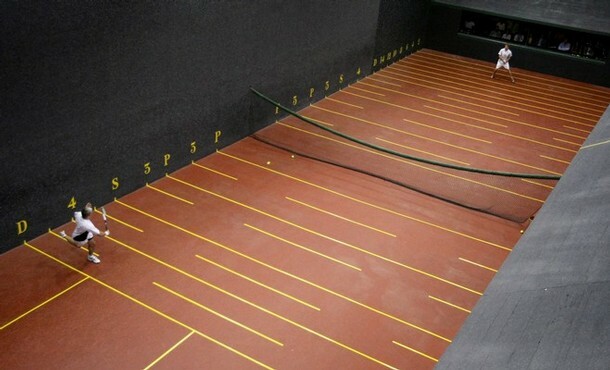 Merton College has its own real tennis court--what American call "court tennis" (the "real" is a corruption of "royal" as the origins of the game are associated with Henry VIII's court at Hampden Court Palace. Had a nice chat with the pro here and got to watch some play. 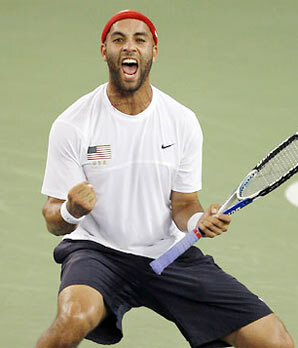 Roger Federer's 2008 woes continued as he was upset today by American James Blake in the Olympic competition. This was a terrific win for Blake, who previously had taken but one set from Federer in eight matches. This result advances Blake to the semifinals, meaning he's one of four players vying for three medals. Should he win against Chile's Francisco Gonzalez, he'll be assured at least the silver. In the other half of the draw, Rafa Nadal and Novak Djokovic will meet. Can we assume right now these two are the best two players in the world, at least based on current form? 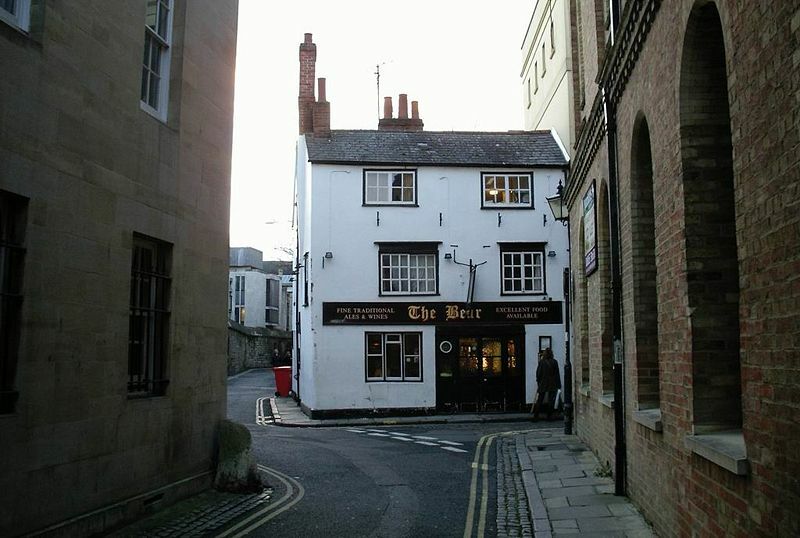 One of the attractive features of Oxford is the pub tradition. The Bear, which is quite near my lodgings in Merton, is a 13th-century pub that is still around and has got lots of charm. One can imagine following in the footsteps of dons and students over the centuries who warmed themselves in such taverns, unwinding over discussions of politics, literature, philosophy, and politics. The about-to-be-#1 player in the world Rafael Nadal prevailed in three sets in the Olympic Games semi over Novak Djokovic to earn a gold medal showdown against Fernando Gonzalez of Chile, who beat American James Blake after saving match points in the third set. The touch that was worth $1 million, I guess. 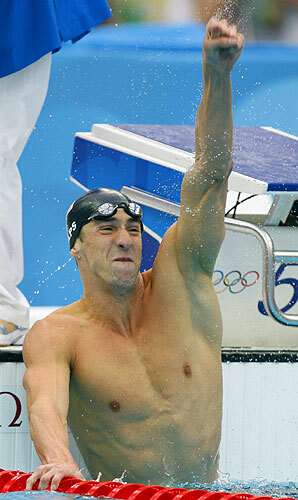 By just .01 seconds, Michael Phelps won his seventh gold medal of the Beijing Games, earning a hefty bonus from Speedo for tying Mark Spitz's record (and Phelps could add to his haul with another relay victory tomorrow in his last race of these Olympics). It REALLY doesn't get any closer than that. Spent part of this morning poking around Christ Church College here in Oxford. The iconic Tom Quad, pictured above, is at the heart of the College, but oddly enough it's the staircase entrance to the college's impressive hall that may be best known around the world, as it has been featured in the Harry Potter films as a stand-in for Hogwarts in some scenes. My flight to Zurich was a bit delayed by a security alert at London Heathrow, though it was otherwise uneventful. As I'm just in Switzerland for one night, I checked into the hotel connected to the airport: an SAS Radisson that opened just two weeks ago on August 1. It reminds me of the similar Radisson hotel I stayed in while in transit at London's Stansted Airport a few summers back. 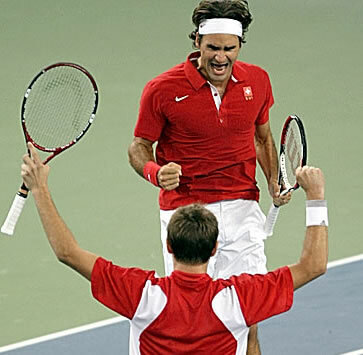 Congrats to Roger Federer for winning the Olympic doubles crown with Stanislas Wawrinka. Though it's not the event he preferred to medal in, I'm sure, this has to be a pretty sweet consolation. And it might be just the thing to stoke Federer's confidence heading into the U.S. Open. I used the iTunes Store today in a way I never had before: I downloaded a movie to watch on a rental basis. Having spent a week in Oxford now and having read Philip Pullman's "His Dark Materials" books last summer, I thought it would be neat to check out the film, which I missed when it was released in the theaters late in 2007. The first part of the story is set in Oxford, though as the above picture of London suggests, it's a fantastic alternate world. I now have 30 days to begin watching the movie, and once I do I must finish it within 24 hours. I'll probably watch it in the next two days. I took an early but sparsely populated flight from Zurich to Venice this morning, and then a water taxi from the airport to the Piazza di San Marco, the heart of the city. My hotel though a bit hard to find, is just 50 meters from the plaza itself. Fortunately, the room was ready for my early check-in. 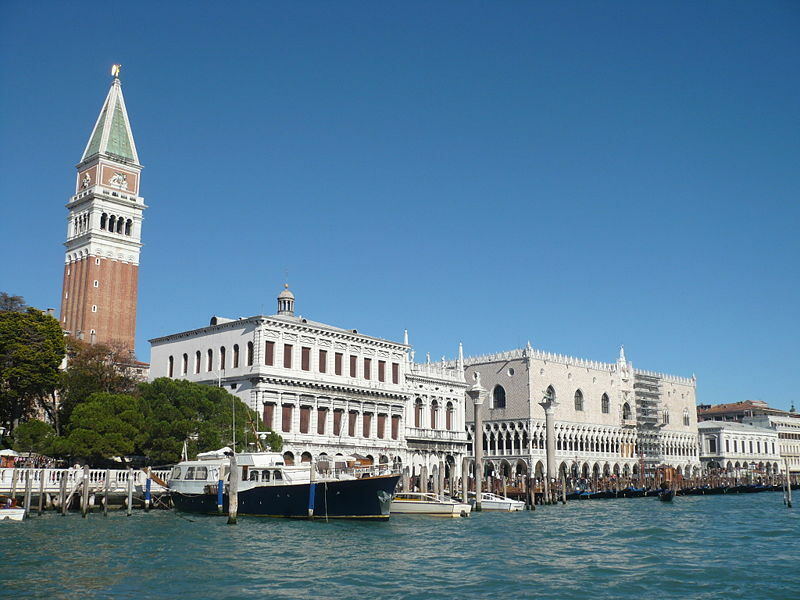 Arriving at San Marco by vaporetto (the Italian for "water bus") I was struck how the modern city seems relatively unchanged from all the images of Venice I've seen in classical art. Compare the contemporary photo above with the painting below--mindful of its older boats and the slightly different angle--and you'll see what I mean. 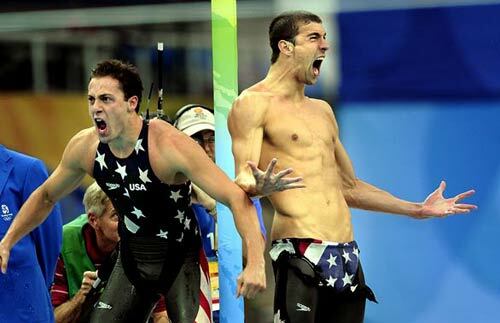 The Beijing Games started on 8/8/08 and Michael Phelps has run the table to win 8 gold medals in 8 attempts. Hard to argue he's not the greatest Olympian ever (what with another 6 golds from 2004 already in hand and a good shot at more shiny hardware in London in 2012). 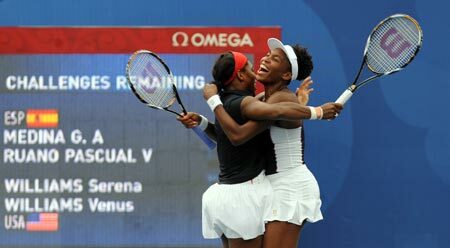 The Williams sisters won their second gold medals in doubles (after winning in Sydney in 2000), winning the Olympic competition fairly decisively. Congrats! In my short time in Venice already, I've become accustomed to the sounds one must live with in such close proximity to the Piazza di San Marco. There are bells that peal loudly and regularly throughout the day. And just outside my hotel window, pigeons coo and flutter their wings routinely. I don't find either set of sounds at all annoying; rather, they remind me I'm in a place far from home. I just finished watching the gold medal match in my hotel here in Venice. 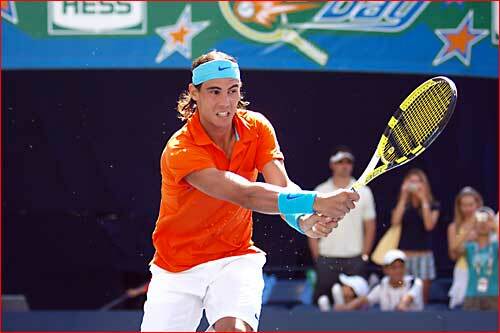 Rafa Nadal was impressive in dismissing Chile's Fernando Gonzalez to win the tournament and claim a medal for an otherwise lackluster Spanish effort in Beijing. The coverage of the match was on a Spanish channel--there were other events for the sampling on Italian and German networks--which meant some very excited announcers, of course. Nadal is clearly on top of his game heading into the final major of the year in just another week. Let's hope he recovers for the Open after a very taxing summer. As Apple aficionados are prone to speculate endlessly about the company's forthcoming product debuts, there has been a decent amount of chatter on the Internet lately about the prospects for a Mac-based tablet computer. 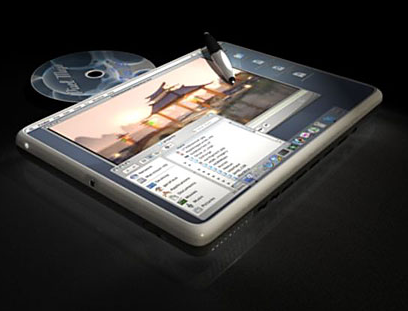 Now who knows if the concept presented in the above photo bears any semblance to what the folks in Cupertino may be bringing us in the future, but should Apple put together something like that, with an effective implementation of handwriting recognition, it will be hard for me to resist scooping one up. After dinner I caught a glimpse of a spectacular full moon rising over the Grand Canal; it was strikingly reddish, almost salmon pink really. Then I entered the Palazzo delle Prigione, a former prison connected to the Doge's Palace by the Bridge of Sighs. Inside a five-piece string ensemble played works by Mozart, Galuppi, Bach, and Rossini--a pleasant late evening concert here in Venice. Apparently the classical music scene is quite active in the city. Breakfast in my hotel this morning was served on a terrace just steps away from my room. It was Continental style: some ham and cheese on offer, with different types of cereal and breads and a bit of yogurt. In other words, no hot food. 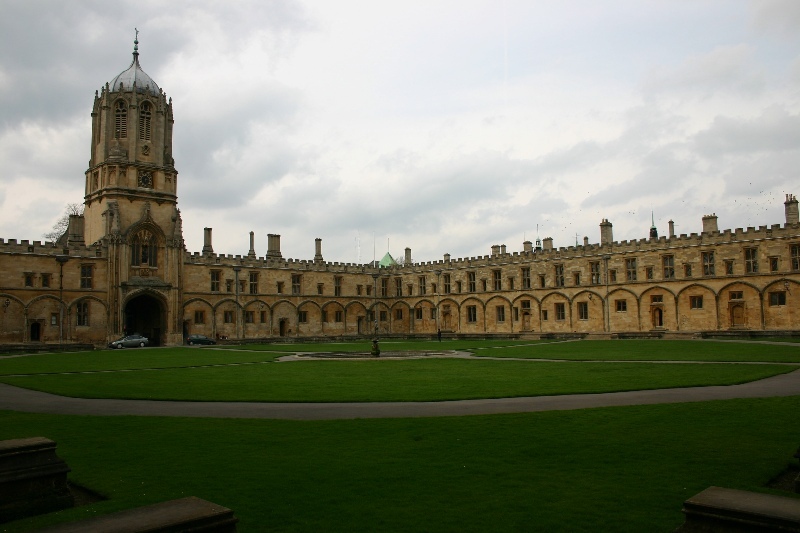 What I miss from Oxford is the daily English breakfast served in the Merton College hall, with fried eggs, the British version of bacon (which is more like smoked ham than what we are used to in the states), and sausage as well as ample toast on the side. 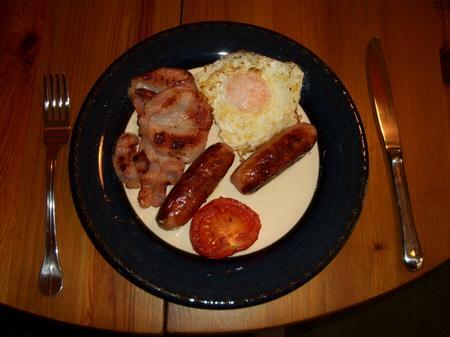 Generally baked beans and tomato and mushrooms are included in the English breakfast, though I pass on those. Juice and tea were readily available as well. The Continental breakfast just doesn't compare to that. 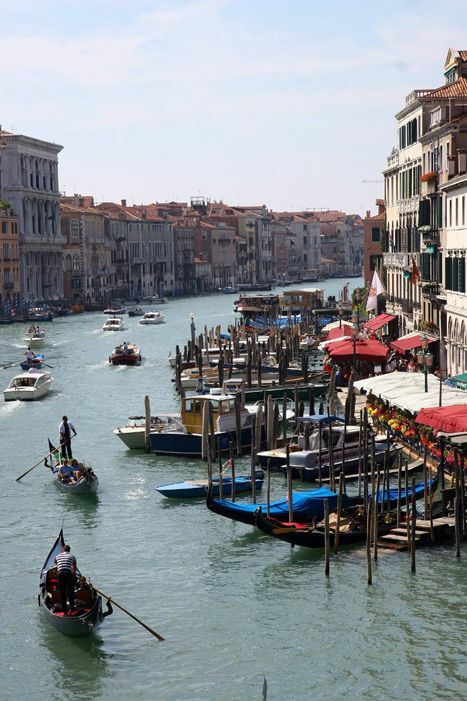 I took the advice of a traveler who had been to Venice before and left my map in the hotel room, opting to find my own way through the narrow winding streets of the city. What passes for "streets" in Venice would be considered "alleys" most anywhere else. But there are enough signs indicating the direction of the major landmarks of the city that one can find his way without too much trouble. Taking a wrong turn, of course, quickly becomes a dead end unless you can walk on water. But you can't really be off course for long in this place. Venice truly has maintained its Old World feel. Part of that is the lack of traffic and its accompanying noise: quite simply, there are no cars, buses, or cycles anywhere in sight or in earshot. Nor does one see skyscrapers dominating the landscape. Also missing are the logos and advertisements for multinational brand names one is accustomed to seeing all over a modern city. That's not to say that Venice isn't commercial; indeed it's clear this place thrives on the tourist trade. It is possible to stumble onto a McDonald's and a Burger King, but they are well out of the way, rather than prominently positioned in Piazza di San Marco, the way such establishments are clearly visible in Times Square, Piccadilly Circus, or even Red Square. 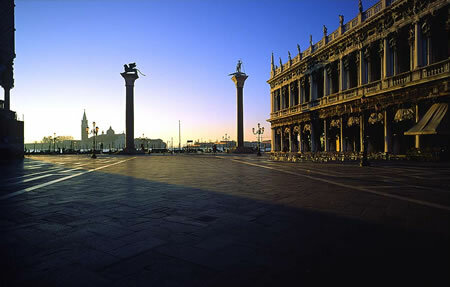 And so Venice seemingly has kept the more obvious signs of globalization well hidden in preserving a traditional appearance that still has a lot of charm for the visitor. 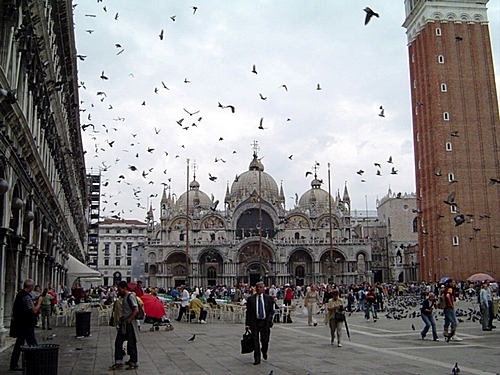 Every time I walk through the Piazza di San Marco, I'm reminded of a Thomas Cole painting, the third in a series of five known as "The Course Of Empire." 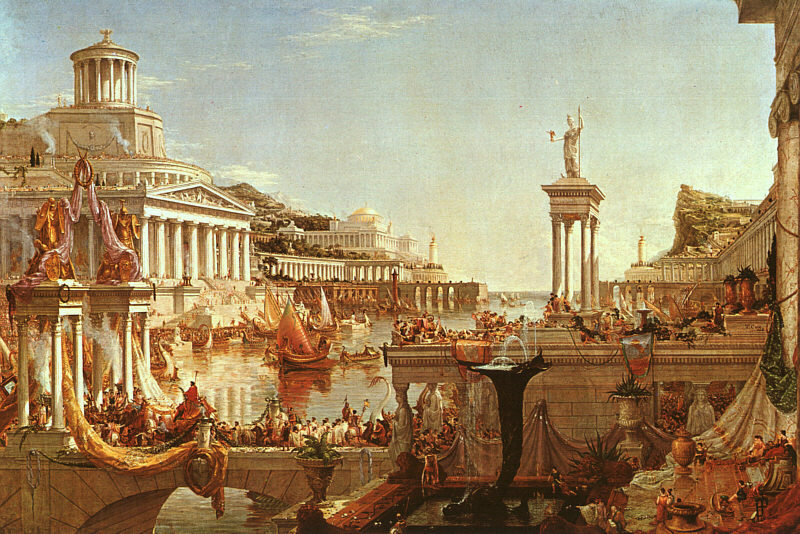 The painting in question is called "The Consummation," and it depicts a prosperous port city in all its abundant glory, a city-state at the zenith of its power. The arrangement of the architecture in the Venetian plaza--the ornate Byzantine architecture of the basilica, the adjacent formidable ducal palace overseeing the Grand Canal, the clock tower, and the twin columns featuring the lion of Saint Mark and the statue of Saint Teodoro of Amasea atop them--all suggest Cole's magnum opus. I suppose Cole's "Course Of Empire" paintings are my mind because I saw them recently in a slide presentation at one of our seminar meetings out at Stanford a few weeks back. I also remember seeing the original paintings in person at the Wadsworth Athenaeum in Hartford ten years ago with a Choate American Studies class. It's official: there's a new #1 in men's tennis today, and that is Olympic gold medalist Rafael Nadal. 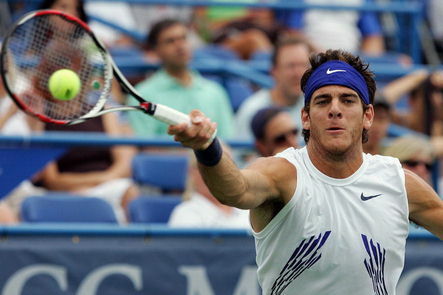 Meanwhile, 19-year-old Juan Martin Del Potro of Argentina has won four consecutive tournaments on the tour and is sneaking into dangerous dark horse territory in next week's U.S. Open. I didn't get to see much of the city this morning, as I had to spend some time on the MacBook attending to some pressing work for the start of the school year. And now it's time to leave Venice. I've enjoyed my short stay here and we'll definitely planned to return to this beautiful city. I have a short layover in Switzerland on my way back to London. On the trip to the airport back in Venice, I was treated to much better views of the city from the vaporetto route, as it was a spectacularly clear day, unlike the rain and overcast weather that greeted me as I arrived in Venice on Sunday morning. After my short flight from Zurich I had (unusual) good luck in Heathrow, quickly making my way past the immigration checkpoint, getting my bag off the carousel without a wait, and then clearing customs without a hitch and catching the Piccadilly Line train to the Covent Garden stop and my hotel on The Strand. After a bit of down time to get cleaned up and changed, I had a late dinner with a Choate graduate from the Class of 1994 and seven of his friends and family members from Kuwait. We ate at Aaya, an upscale Japanese restaurant in Soho on Brewer Street, just behind the old Regent Palace hotel where I frequently stayed in London (but the huge 700+ room hotel has been shut down the last couple years). It was a spectacular meal of first-rate Japanese cuisine, and somehow somebody picked up the check for us all on the sly, so it was a real treat. I passed on the chance to go clubbing with the group afterward, knowing I've got an early flight home in the morning. My American Airlines flight just landed at Logan Airport, which means I can reactivate my iPhone. I've had it in airplane mode since leaving the States almost two weeks ago. I'm determined to avoid outrageous charges for telephone or data access while traveling abroad, so I cut off all connectivity for the device while in Europe. Shortly after getting back home, I drove down to Stamford to attend a gathering of incoming new Choate students and their parents. it was an altogether pleasant affair--a good chance to meet new families as well as reconnect with some familiar faces--but it does hammer home the reality that the beginning of the school year is just around the corner. I trekked into Manhattan tonight to see this season's hit revival of South Pacific. There's not a bad seat in the Vivien Beaumont Theater at Lincoln Center--a venue where I had seen Tom Stoppard's Arcadia and Kevin Kline in Henry IV in years past. I was not familiar with this particular Rodgers & Hammerstein show, but left impressed by both the work and the performance. I worried that the 1940s setting would make the piece seem dated, but it has held up quite well over sixty years later. 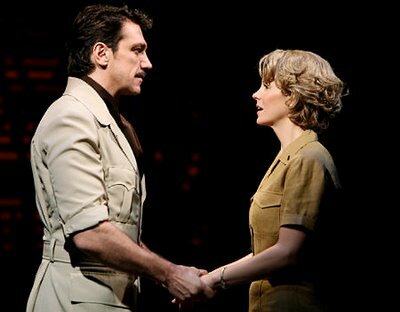 Kelli O'Hara was terrific as Nellie Forbush and Brazilian opera singer Paulo Szot, who won a Tony for this role, was equally formidable as the male lead. The entire company was well cast, for that matter. The production values were strong, with effective sets and lighting, and a 30-piece orchestra did justice to a compelling score. 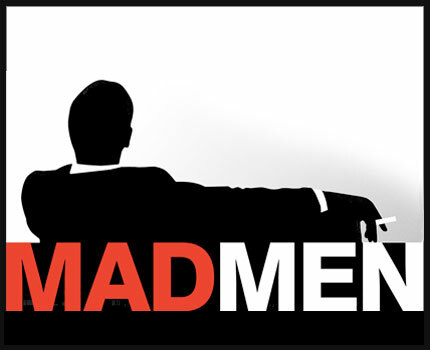 Having finished the first season of Mad Men on my flight back from London on Wednesday, this afternoon I started clearing the DVR of the new shows that started airing this summer. 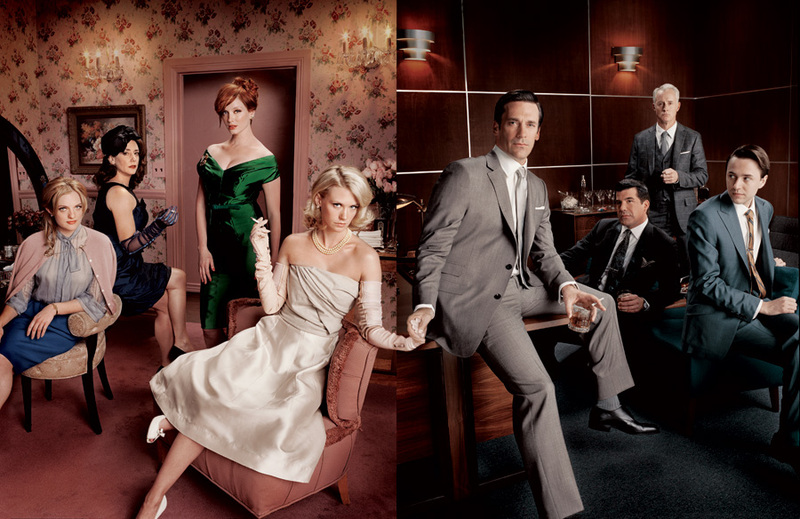 Happily Mad Men is just as provocative and enjoyable in the Season 2 episodes. 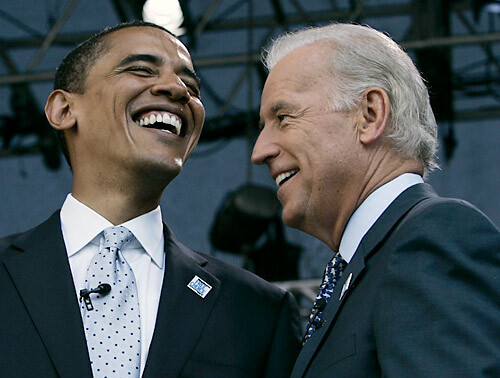 I awoke to the news that Barack Obama had chosen Joe Biden to be his running mate this year. Biden would not have been my first choice, I suppose, but there's a certain logic to the pick in that he brings substantial foreign policy credibility to the ticket and he also appeals to the working class voters in the Northeast and Midwest that Obama seemed to have trouble connecting with in the Democratic primaries earlier this year. 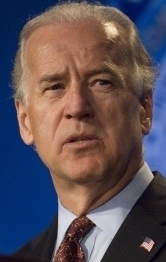 I am convinced that the Catholic vote will be the pivotal factor in the November election, and Biden--a Catholic himself--seems a good choice to appeal to that demographic. 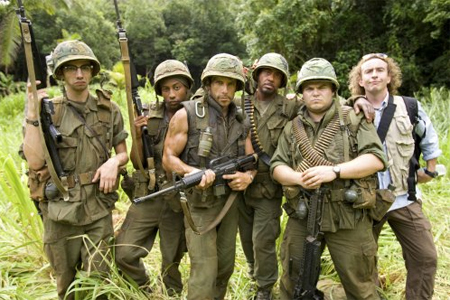 I caught the matinee of Tropic Thunder early this afternoon. My expectations for this film were probably a bit high, and so of course I found it amusing but a bit disappointing. There just weren't the over-the-top belly laughs I expected. No doubt Robert Downey Jr. continued the hot streak he established in Iron Man earlier this summer; he is terrific playing a role within a role. And Ben Stiller, Jack Black, Nick Nolte, Steve Coogan, and a heavily disguised Tom Cruise all delivered solid performances. If you head into this flick not expecting much, you'll have a great time. 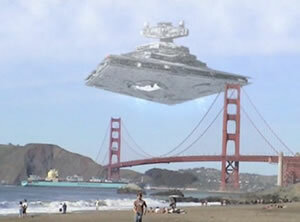 If you do see it, be sure you get there on time, as there are a couple of fake ads and previews that set up the movie. I dashed home from the movie theater to catch Senator Obama's introduction of his VP choice, Joe Biden of Delaware. The two appeared at a rally in Springfield, Illinois. After listening to the two speak, I feel much better about the ticket now that it has materialized. I think Biden, though not a perfect candidate, will be an effective presence to challenge John McCain in the traditional running mate's role of attack dog, but he'll do so with humor and an affable personality. And he does round out the perceived shortcomings of his partner atop the ticket. I'll be very curious to see who McCain taps in a week's time. 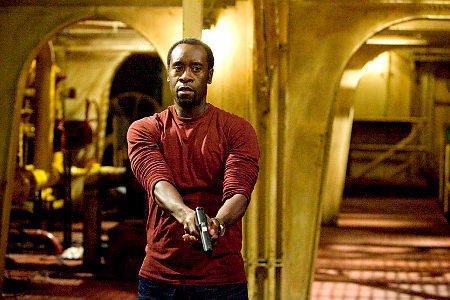 After dinner I caught the French thriller Tell No One (Ne le dis a personne) in New Haven. I was considering heading up to Hartford for the John Mayer concert, but decided against the parking hassle and scrambling for a decent seat on the lawn. The film, based on an American novel, was quite engaging: a mystery/thriller set in and around Paris involving a pediatrician facing new questions about his wife's death some eight years before. The U.S. Open begins in less than 24 hours. 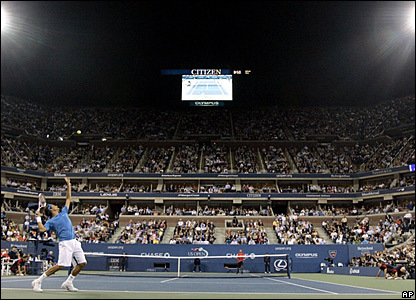 A handful of compelling storylines are at play in the final major of the 2008 tennis season. The event will be competing for attention with the Democratic and Republican conventions. I am heading in to the Open this Tuesday. Should be fun! 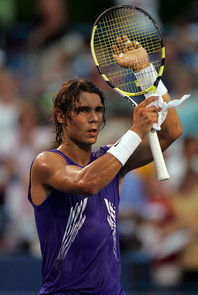 I am watching Rafael Nadal's first-round match at the U.S. Open--his inaugural outing as the world's #1 player. It doesn't look like he is playing particularly well, I have to say. 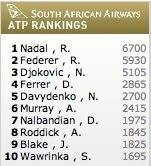 Bill Macatee made an interesting point, though: in May, Nadal was just a match away from dropping to #3 in the rankings. He has certainly put together an incredible summer of tennis since then. It would be a shame if fatigue catches up to Nadal such that he doesn't go deep into the second week of this year's Open. Obviously there would be tremendous interest in another Federer/Nadal showdown. Given what is was intended to do, Michelle Obama's speech was very effective at humanizing her and her husband and extending a compelling narrative about "ordinary folks." What really sealed the deal, though, was the spontaneous behavior of the two young daughters on stage with the open microphone. How many million votes were sewn up right there, I wonder? Spent most of today at the U.S. Open, primarily prowling around the outer courts, taking in bits of matches here and there. 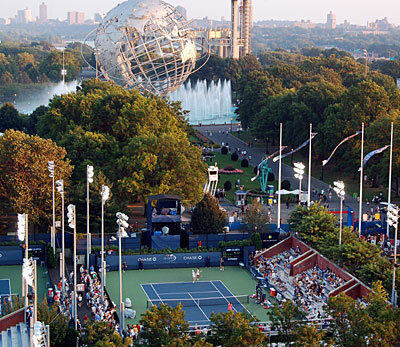 I've been going to the tournament since it was played at Forest Hills, and I'm convinced the first few days of the best time to attend, since you can see lots of main draw action around the grounds and get a feel for the entire event. On the other hand, it's far better to see the big showdowns in the quarters, semis, and finals on television, which enables you to be more intimately connected to the drama unfolding. 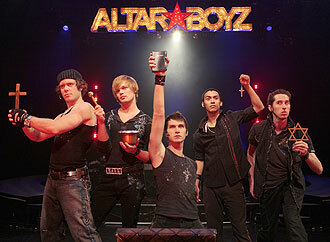 I saw a production of Altar Boyz at the Long Wharf Theatre in New Haven on my way home from the city. The show is a musical parody of the boy band phenomenon with a religious twist, but it was probably a bit too camp for my tastes. it was reasonably entertaining, but I'd hardly recommend someone rush out and see it. 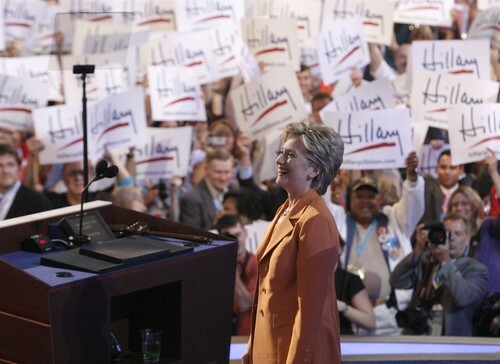 After exhaustive speculation in the media about how Hillary Clinton would handle her supporters and throw her weight behind the Obama candidacy at the Democratic National Convention in Denver, there can be little doubt she stepped up with an effective, emotional, and shrewd speech. 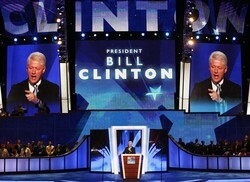 It is, of course, in her own best interest to offer full-throated support for the Democratic nominee; if Obama were to lose in November without the Clintons' support, Bill and Hillary would have effectively written their own epitaphs with most Democrats nationwide. It is pretty likely Bill Clinton still harbors great resentment about the way the Democratic primaries unfolded earlier this year. That said, there's little doubt the former president delivered another of his masterful orations tonight, throwing his support clearly behind the Obama candidacy and making the case that the senator from Illinois is prepared to be commander-in-chief. 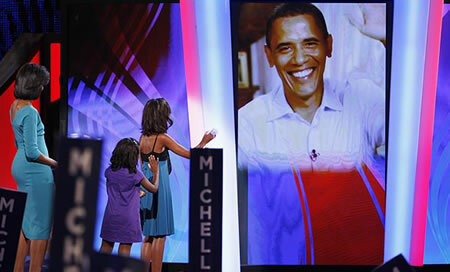 Barack Obama delivered a masterful speech accepting the nomination of the Democratic Party this evening. He effectively made the case for his presidency by poignantly delivering his personal story, offering specific policy initiatives, effectively refuting the recent attacks from the McCain camp, and doing it all with a thoughtful, engaging, and lucid address. This one was really hit out of the park. 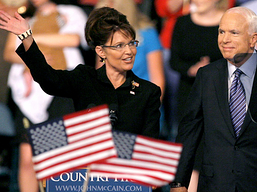 Republican presidential candidate John McCain surprised the pundits and the American people with his choice of Sarah Palin as his running mate. The little-known Alaska governor was a bold choice, one that will be seen as either brilliant or bone-headed a couple months from now. She certainly will shore up McCain's support among the right wing of the GOP, but I'm less certain her presence on the ticket will enable the Republicans to attract the support of Hillary Clinton backers, which I think was the real goal in this selection. It will certainly be a lot harder for his opponents to criticize Senator Obama as too inexperienced, given the remarkable lack of seasoning Palin offers for one potentially just a heartbeat away from the presidency. The Choate cross country team went to the movies tonight and about half the group joined me watching Traitor, a new film starring Don Cheadle, Guy Pearce, and Jeff Daniels. It's really not a spy movie in the vein of The Bourne Identity; rather, it is a thoughtful, if predictable, thriller about terrorism at home and abroad. Our pre-season training camp for Choate Cross Country involves two practice sessions a day and lots of down time in between. So in order to keep the guys busy, we have built some traditions around go-kart races and a nighttime miniature golf outing. I'm pleased to report I held my own, with a dominating performance behind the wheel and a second-place result in the mini-golf. This page contains all entries posted to As Far As You Know in August 2008. They are listed from oldest to newest.